We all do the best we can to protect our vehicles and we all make sure to keep them maintained against all possible threats and dangers. However, it should not be surprising to learn that one of the greatest dangers to high mileage cars is also one of the least well known. While we expect and try to prevent cases of engine or transmission failure, the death of many older or high mileage cars is nothing other than a failure of the timing belt. 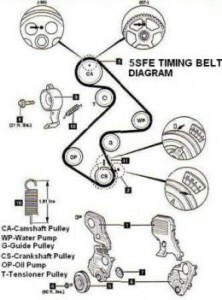 However, in order to understand what makes the timing belt so important and how we can prevent it from failing, we first need to learn a little bit about what it does and what we should expect from specific car models when it comes to life expectancy of the belt. The timing belt serves a very important part when it comes to making your engine run. Namely, the timing belt is the belt that controls the camshafts in your engine and keeps the entire operation running smoothly. Note that timing belts are present in engines with overhead cams, and are essential to keep these cams turning at the right time in order to keep the engine running. Remember that a camshaft is the shaft that opens and loses the intake and exhaust valves in your engine, both letting air in to create combustion, and venting the exhaust that comes from those explosions. A timing belt must be properly calibrated in order to move in time with the motion of the pistons. When it comes to engines, the two most important terms to remember when talking about timing belts are “interference” engines and “non-interference” engines. Interference engines have a very, very small amount of space between the valves and pistons, while non-interference engines tend to have a lot more room. The different types of engines make a major difference when figuring out how bad a timing belt failure can be for your engine. In an interference engine, with little space between the valves and pistons, a slip or break in the belt can send a piston flying into an open valve. When this happens, it is similar to the engine self-destructing, as it will soon become nothing more than an unusable mess of metal. This is not to say, however, that a timing belt failure in a non-interference engine will not be damaging, as it can still cause a great deal of damage to many engine components. Generally speaking, however, a timing belt failure in a non-interference engine will not cripple the motor. If all of this sounds like a nightmare, that’s because it can really urn out to be one. Luckily though, timing belt failure is somewhat easy to prevent, and although it may not be the cheapest or easiest operation in the world, it is definitely a better option that purchasing either a new car or a new engine.